“Do Good. 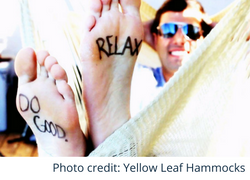 Relax.” That’s the motto for Yellow Leaf Hammocks, a mission-driven brand that offers beautiful hand-woven, customizable hammocks while cultivating long-term economic health, environmental stewardship and social equity for marginalized ethnic groups. The company began when it partnered with the endangered Mlabri tribe in Thailand in 2011 after co-founder Joe Demin visited on vacation and was inspired by the locals’ hope for stability and a fresh start. By embracing the tribe’s weaving culture, investing in the community’s prosperity and providing high-wage weaving jobs, Yellow Leaf Hammocks has helped make incredible strides in the area, including slowing deforestation and bringing back the Mlabri language from extinction. 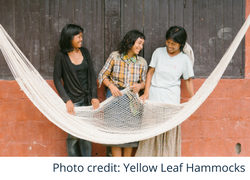 In fact, Yellow Leaf Hammocks weavers earn 650 percent of the average tribe income (or the same as a Thai college-educated teacher). Usually, Mlabri children have to work alongside their parents and put aside education, but weavers earn enough to send their kids to school, without worrying about putting food on the table. As the company says on its website, a responsible “eco-luxury brand” gives consumers peace-of-mind and intricately constructed products. And Yellow Leaf Hammocks are no exception. Yellow Leaf Hammocks promotes ethical job creation by cutting out the middle man and working directly with impoverished communities. Through 1) environmental stewardship, 2) economic health, 3) social equity and 4) cultural vitality, the company believes it can permanently break the cycle of poverty and improve communities for the next generation. The company also stays true to its word, with 100 percent of products sourced from ethnic groups such as the Mlabri. 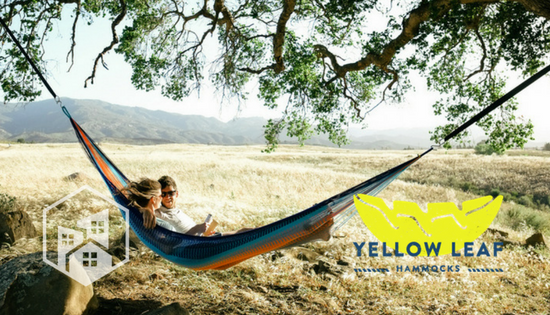 Plus, more than 75 percent of Yellow Leaf Hammocks’ printed materials use recycled paper, FSC-certified paper or soy-based inks. By proving its business model in Thailand, the company plans to duplicate and introduce its micro-economy model to other vulnerable communities that could benefit from weaving hammocks. Increased socio-economic security allows communities to invest in its people and infrastructure, and Yellow Leaf Hammocks works to be the conduit for success (and comfort). The Signature hammocks is the brand’s most popular style. It features soft, weather-safe and fade-proof yarn, and is constructed with 150,000 loops that “cradle you weightlessly.” The Signature hammock come in double and king s and prices range from $199 to $279. If you’d rather relax upright, Yellow Leaf Hammocks also offer a $179 Hanging Chair hammock that acts as a chair but is able to stretch out if you change your mind and would rather recline. 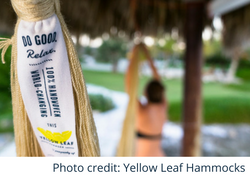 Both Signature and Hanging Chair hammocks have the option for customers to “design your own.” With this option, you’ll receive a design guide and access to concierge support from Yellow Leaf Hammocks’ own design team. While you might spend a bit more designing your own ($229 to $249), you’ll get the pleasure of knowing you’re helping an underprivileged community regain control of its independence and get a hammock that matches perfectly with your home decor. 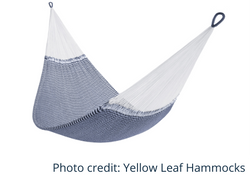 Where can you find Yellow Leaf Hammocks? You can find all products online, here. If you would rather feel fabric and experience the hammocks in-person before you purchase, you can check out the hammocks at a few of the company’s partner locations. Salt & Sundry, TOMS, Whole Foods Market, Kate Spade, SXSW and Made In A Free World all carry Yellow Leaf Hammocks.